Pride month 2018 was a wonderful celebration of diversity and inclusion with glitter, rainbows and a plethora of Pride-centric social media tools taking centre stage. While Apple rolled out a Pride-themed rainbow background for the Apple Watch and Calvin Klein introduced an eye-popping range of rainbow-striped underwear, other top brands waved the LGBT flag on social media with some innovative, passionate and supportive campaigns. It was great to see so many companies unite in their love for the LGBT community – but who did it best? Let’s take a sneak peak at how the top brands celebrated Pride month 2018. 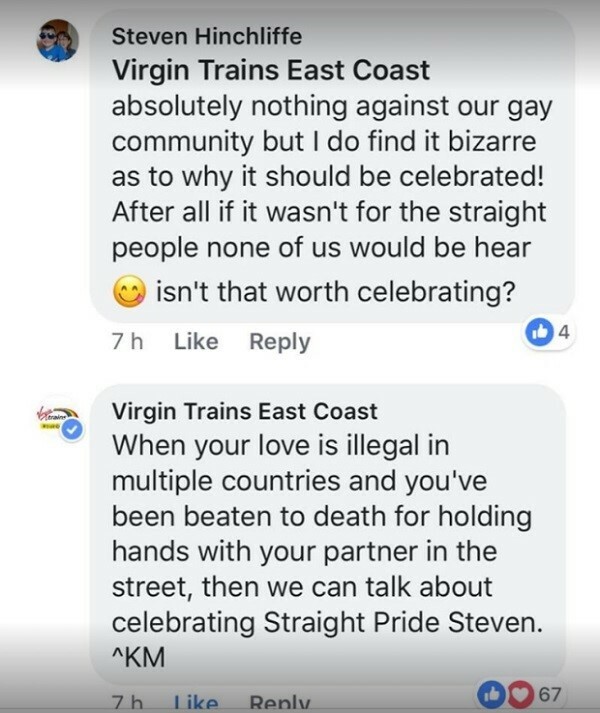 Virgin Trains not only acknowledged Pride month, but went to Rainbow Town in a bid to stand by the LGBT community and celebrate diversity within the Virgin community. The train company added the rainbow flag and #Trainbow to its logo and even rolled out a rainbow-coloured Pride Train using the provocative and cheeky hashtag #RideWithPride. As with many social campaigns these days, the company did face a certain amount of backlash with some Twitter users asking why Pride should even be celebrated. Virgin Trains, however, was not afraid to respond to bad PR with a series of strong replies. 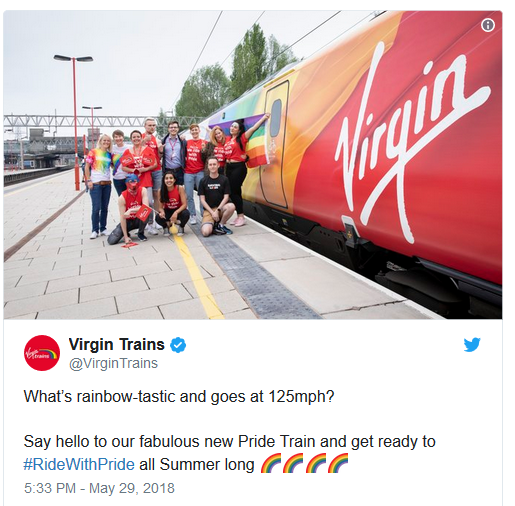 When people questioned if the company’s Pride efforts were solely for promotional reasons, Virgin Trains also had a very passionate and direct response which in itself gained support and attention on Twitter. Takeaway: Decide your brand values and stick to them. If your social strategy is genuine, meaningful and honest in nature there’s no reason not to fight your corner and defend your reputation as a respectable company – but beware. Jumping on the bandwagon just because you want to benefit from a particular calendar event is not wise. People don’t easily forget and if you were ever associated with homophobic comments or activity (as an example), your campaign could face severe backlash. 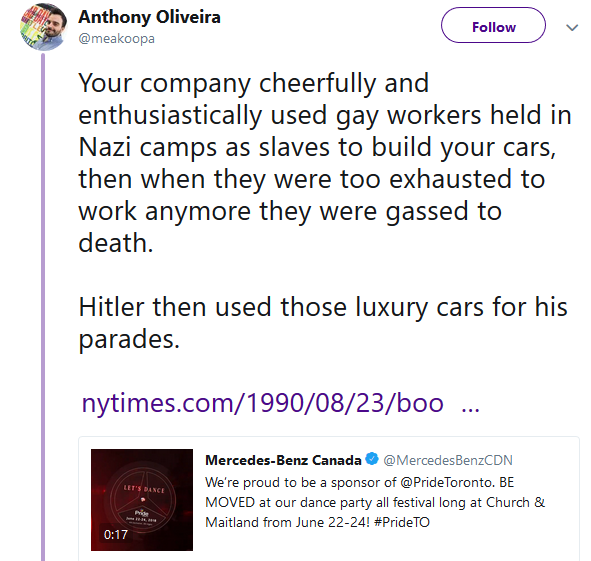 This kind of knee-jerk reaction was recently witnessed in response to a Pride post by car manufacturers Mercedes-Benz. American fashion house, Kenneth Cole, launched their #TiedWithPride campaign to coincide with the rainbow stripe update on the back of their iconic Kam sneaker which was also made available in black. The company has been proud supporters of the LGBT community and equality for over 25 years with their views being backed by a full Pride clothing collection. 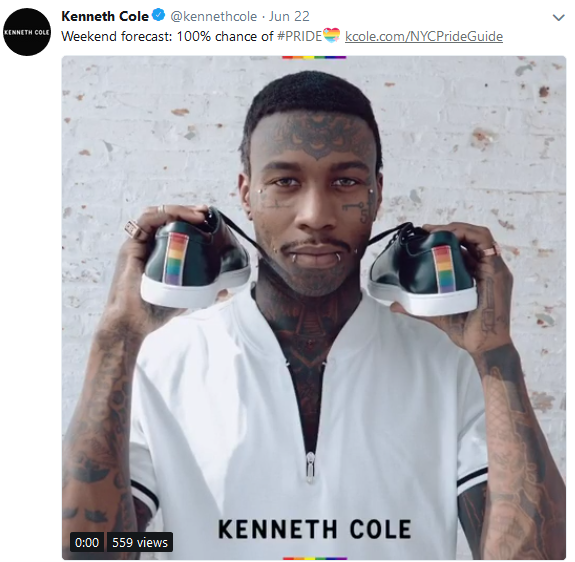 What made the Kenneth Cole social media efforts particularly exciting this year was the inclusion of Pride Guide links which were designed to help people celebrate to the max. 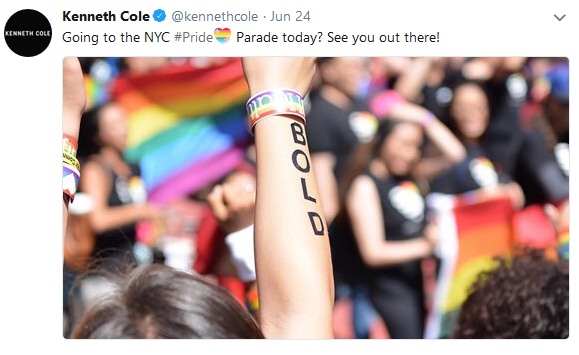 Kenneth Cole didn’t just talk the talk either; they walked the walk by attending key Pride events such as the NYC Pride March, directly interacting with fellow attendees via Twitter. Takeaway: Shape your brand around distinctive morals and ethics. Engage your target audience by being involved with relevant events and celebrations. Not only does this help to build trust among your followers but it also shows a genuine passion for what you do and promote. For the first time in history, Speedo USA embraced Pride celebrations showing it’s never too late to fully embrace diversity. As a division of PVH – which was once again a Platinum Level Sponsor at the NYC Pride March 2018 – Speedo USA joined other top brands including Calvin Klein and Tommy Hilfiger who were also new to the Pride party. Speedo USA launched a limited edition Pride Collection consisting of nine ‘rainbow kissed’ items including goggles and caps. 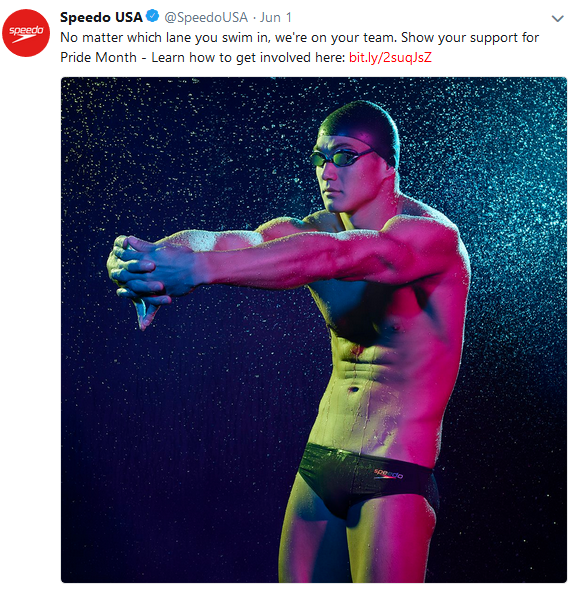 Their social media efforts very much reflected the theme of inclusion and diversity with the company using slogans such as: “No matter which lane you swim in, we’re on your team.” Go Speedo! The capsule collections offered by the three brands mentioned above were not released solely for promotional purposes. Indeed, a portion of all proceeds made throughout June went to the Human Rights Campaign Foundation. The Speedo Pride Collection in particular was particularly designed to support diversity in swimming with Speedo USA promising to donate products to US Masters Swimming LGBT teams. Takeaway: With fame comes big responsibility and therefore it’s important to take corporate responsibility seriously. Where possible, give back to the community but make sure that you associate with activities and causes that are a true reflection of your brand’s morals and ethics. While it was awesome to see so much online support for the LGBT community, it should be noted that Pride isn’t just about rainbows and glitter – as nice as they are. President Bill Clinton proclaimed June as Pride month back in 1999 in recognition of the Stonewall Uprising of 1969 which saw gay people stand up to the police. It marks years and years of prejudice and struggle, so if you’re going to acknowledge Pride month it’s essential to do it respectfully and properly. Think carefully about what you want to do and say – and don’t just jump on the bandwagon unnecessarily by using inappropriate social media hashtags. While hashtags are an essential part of any Twitter campaign, make sure that they’re relevant to your brand’s Pride efforts. Using a hashtag just because it’s trending is not cool, especially if you’re talking about something completely irrelevant to Pride. “Don’t forget to join in our online marketing debate tonight at 6pm #marketing, #contentstrategies, #pridemonth” for instance is just not right. At Contentworks, we’re all about equal opportunities and the creativity brought about by diversity, but we certainly had no intention of jumping on every Pride hashtag. Want to find out more about effective content marketing and social media strategies? Contact the Contentworks crew today for a range of fab solutions.